One of the lucky ones, sports writer Ian MacLean is the only member of the Johnston Press Weeklies Sport department to follow Scotland at a World Cup. A Malaga campsite, late morning on June 23, 1982. And one of the saddest sights I think I’ve ever seen. For the past two weeks a tightly-packed collection of tartan and Lion Rampant-bedecked tents have surrounded our own, similar living quarters. Now they’re gone; dismantled and replaced by a barren expanse of dusty ground occupied only by bleary-eyed Tartan Army foot soldiers, packing away their belongings as another World Cup adventure comes to an end. It’s the morning after Scotland’s 2-2 draw with the USSR; Willie Miller and Alan Hansen’s little ‘misunderstanding’ has tumbled us out of the tournament. Brazil fans don't so much support their team as perform in concert. The late night post-mortems have come and gone. It’s time to head home. Still, it’s only four years between World Cups. Plenty more to go to. Fast forward to 2018. A whole generation of fans have grown up not knowing Scotland qualify for a World Cup, let alone get the chance to go to one. I will always be grateful the one I experienced was the best of the lot. The sun-kissed beaches of the Costa del Sol. The glamour of a group with arguably the best team - certainly the best Brazilian team - never to win it. You couldn’t script it. The atmosphere at World Cup is all-consuming, it’s everywhere and as a supporter you’re not just there to watch. You’re part of the package. So many memories. Arriving and heading straight to the Rosaleda Stadium in Malaga to buy our tickets for the games against New Zealand and the USSR. The tickets the gloom merchants told us not to travel without because there’s no way we would get them there. Yeah, right. There was still the small matter of obtaining briefs for the game with Brazil in Seville. Not to mention working out how to get to a city which we discovered was several hours away but had looked a helluva lot closer on the map. 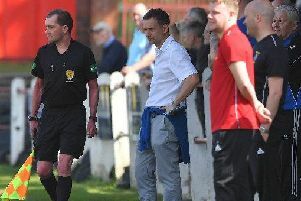 Bo'ness United manager Max Christie delighted with 13 wins on the spin! The Spanish authorities had a similar dilemma, how to get 20,000 of us up to Seville and back to our coastal bases. Simple. They just laid on a series of ‘football special’ trains. On arriving in Seville we split up our party of four in our search for tickets - two to the stadium, the other two to follow up the unlikely lead they were being sold from a city-centre Portuguese travel agency. It’s only noon, the stadium will be quiet this early, we thought. Wrong, the place was heaving. Kick-off time was 9pm, but those nine hours flew by. Thousands of Scots and Brazilians mingled without an angry word. Beer, bagpipes, beer, samba drums, beer, sunshine and more beer for the party to end all parties, made even better when our intrepid duo arrived mid-afternoon clutching four prized match tickets. The Portuguese travel shop hunch had paid off. We were in. So many memories. Being bear-hugged inside the stadium without warning by an elderly Brazilian whose stream of words was unfamiliar but whose meaning was clear. Football brings people together like nothing else. David Narey’s toe-poke bringing unprecedented euphoria before reality set in thanks to the baking heat and a bunch of Brazilians by the names of Zico, Falcao, Junior and Eder. But that Narey goal will forever remain my ‘I Was There’ moment. The Brazil game was always going to be a bonus. The last group game against the USSR was The One. As usual it didn’t quite work out, and in heartbreaking fashion thanks to messrs Miller and Hansen. MacLeod’s in Blackpool’ banner everywhere they went. But perhaps the most significant of all was in the immediate aftermath of that final game against the USSR, when we were at our lowest. Back then the only way to get from the stadium to the city centre was a long walk along one of Malaga’s main avenues. As we trudged disconsolately along each side of the street was jam-packed, lined by locals who turned out to applaud the Scotland fans all the way down it. It wasn’t just to lift our spirits but with genuine appreciation for the atmosphere and fun the Scotland support had brought to their city and region over the previous two weeks. Sadly, the question is – when next will someone else get the chance to do the same?